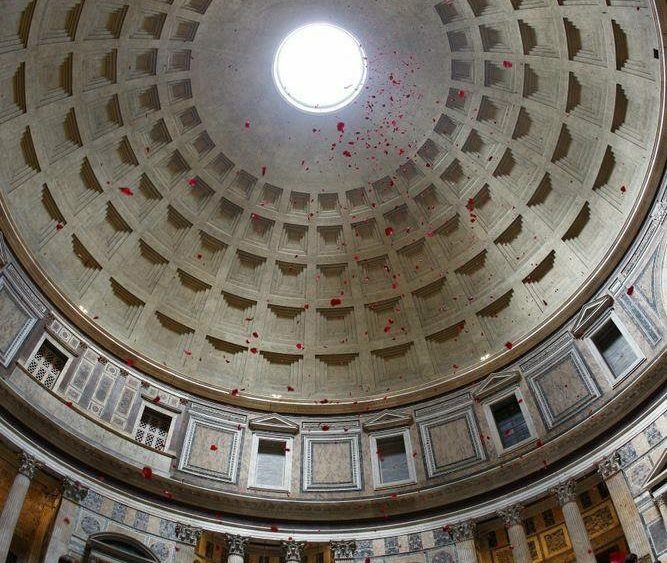 Rose petals are dropped from the open oculus at twelve o’clock noon in commemoration of the descent of the Holy Ghost on the day of Pentecost, the birthday of the Church. The Pantheon was built in 126 AD by the Emperor Hadrian as the temple to all gods. The ancient dome is 142 feet in diameter, with a 30 foot diameter opening (oculus) at the top, and is still the world’s largest unreinforced concrete dome. In 609 the building was converted into a Christian church as Santa Maria and the Martyrs. Some say that the Rose Petal Ceremony began May 13, 609 AD, and after being suspended for many centuries, it was resurrected in 1995. Now each year, at the end of Pentecost Mass (50 days after Easter) this ceremony commemorates the descent of the Holy Spirit upon Mary and the Apostles. Five Roman fire fighters climb to the top of the dome with canvas bags of red rose petals and launch them into the air. 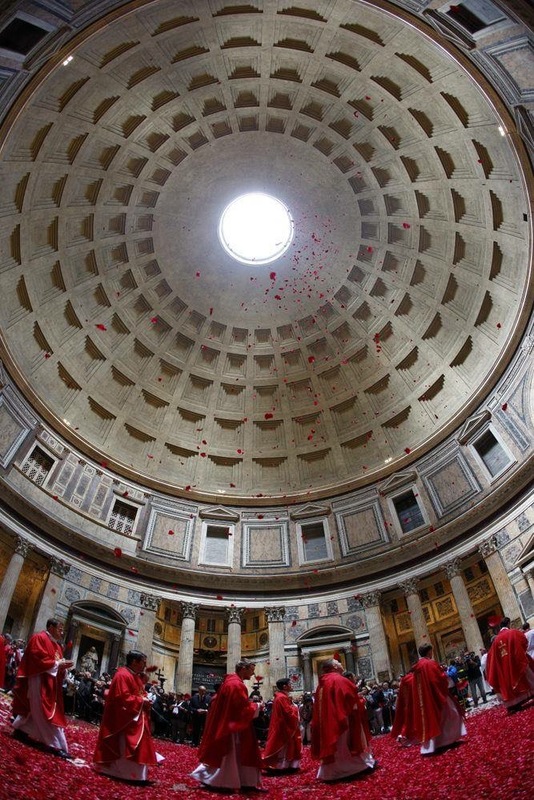 As thousands of rose red rose petals float down through the oculus carpeting the ancient floor at the center of the Pantheon the choir sings Veni Creator Spiritus. As the “dew” falls, the choir chants the sequence Veni Sancte Spiritus: Come, Holy Spirit! Papal Artifacts wishes you a joy-filled Pentecost!